Kalpitiya, located 130 km north of Colombo Bandaranayke Airport, is an exquisite coastal region located in the Western coastal belt north of Colombo. Kalpitiya is a peninsula set in between the deep lagoon of Puttalama to the east and Indian Ocean to the west. It’s a marine sanctuary with a diversity of habitats ranging from bar reefs, flat coastal plains, saltpans, mangroves swamps, salt marshes and vast sand dune beaches. Kalpitiya is one of the best spots for dolphin watching in Sri Lanka. Here you can witness massive pods of dolphins in their natural habitat. The Spinner dolphin is the most common. 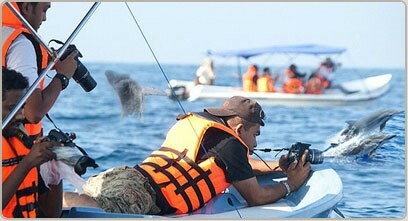 Other dolphins that can be spotted here include Bottlenose, Risso’s and Indo-Pacific Humpback Dolphins. Watching these delightful dolphins swimming alongside and diving under your boat, riding waves in perfect synchronization and twirling and leaping out of the water in a joyous display, is a magnificent experience. 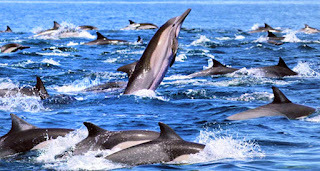 The best time for dolphin watching in Kalpitiya is from November to March/April. During this time, conditions are perfect to view a variety of sea mammals: the monsoon season is over and the seas are relatively calm making it easier to spot dolphins. All tours are carried out by certified guides who have been trained by Kite surfing Lanka to conduct tours in English. They will do a brief on the types of the Dolphins/ Whales we see in addition to sharing valuable information about their behavior and threats these animals face due over fishing.